Here’s a piece I wrote that was just published in The Forward for a U.S. readership about about finding life back in London surprisingly cheering after a few years living in New York – from a Jewish (Orthodox) feminist perspective. Also includes an interview with JOFA UK ambassador, Dina Brawer. Landing back in the Jewish community of my home town of London, U.K., after five years living overseas, I have the heady sensation of being caught up in a full-blown feminist revolution. Back in 2010 when I left for a four-year stint in the U.S. (followed by a year in Kenya), London felt like a neglected backwater languishing decades behind the great world centers of Orthodox feminism in Israel and the U.S. Women were relegated to the “ladies’ gallery,” looking down at all the action taking place in the men’s section of the synagogue, and “feminism” was still a dirty word in the Orthodox Jewish community. There were some signs of grassroots activity — women’s megillah readings on Purim, monthly Rosh Chodesh women’s prayer services, and a training program set up for women to become community educators. But as for any perceptible change in women’s participation at synagogues affiliated with United Synagogue, the country’s largest network of mainstream Orthodox synagogues, it all felt a bit tame and apologetic. A friend mentioned a partnership-style minyan (prayer groups that retain adherence to Orthodoxy but allow women to lead certain sections of the prayer service and the weekly Torah portion), which someone was setting up in their North London home. Apparently, you needed a masonic handshake to gain entry, though, given how controversial such a minyan was considered then. And then I arrived in the epicenter of Orthodox Jewish feminism in the world — Riverdale, New York, where I lived for the next four years. Attending the Hebrew Institute of Riverdale, a synagogue where the first Rabba (Modern Orthodox woman rabbi), Sara Hurwitz, is on the clergy team, and where it’s no big deal for women to read from Torah scrolls on their side of the mechitza on Simhat Torah, or recite Kaddish during services, I saw how women’s active participation could be a seamless part of Jewish communal life. I also saw how partnership minyans and Yeshivat Maharat, the first yeshiva to ordain women as Orthodox clergy, are creating basic facts on the ground, new norms for Orthodox communities. Scroll forward five years and I arrived back in London fretting that I was about to go back to the Dark Ages. How delighted I was to be proved wrong. I came back to a completely transformed landscape. JOFA (Jewish Orthodox Feminist Alliance) has set up shop in London, four proudly out-in-the-open and thriving Partnership Minyans are now established, and lately a group have come forward with plans to create a more egalitarian Modern Orthodox high school. 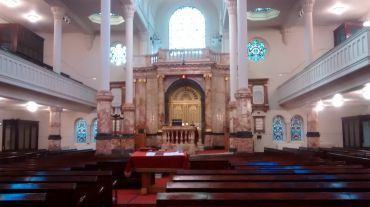 It seems to me so unexpected and exhilarating that I can walk five minutes down the road from my home in Golders Green, a largely Orthodox Jewish neighborhood in North-West London, and hear women leading sections of uplifting Shabbat prayer services run by the lively Golders Green partnership minyan. “I did not see that there were favorable conditions — on the contrary, but I felt that there was an urgent need for action to accelerate the growth of Orthodox women’s opportunities for involvement,” she adds, explaining how JOFA is enabling many “formerly marginalized women and girls” to find a new place for themselves in Orthodox Judaism. While mainstream Orthodoxy is still resistant to much of JOFA’s philosophy, Brawer cites several important changes that the organization has engineered since its inception, including: “This is the first time individuals have felt empowered to create religious events outside the established structures, for example minyanim or ceremonies in their own homes to celebrate bat mitzvahs”. Brawer also points out that the UK’s Chief Rabbi Ephraim Mervis has already implemented some of her suggestions, including her call for talented women to be given the opportunity to become community leaders independently of being married to rabbis. Mervis has recently launched the Ma’ayan Programme, a high-level qualification for women in laws of family purity and women’s health which, on completion, will enable them to take on leadership roles in Jewish communities. JOFA is also running education programs for Jewish students on UK campuses, and an awareness-raising campaign about the Agunah and Gett abuse issue, among other activities. A great time to be an Orthodox Jewish feminist in London. ← Single, Orthodox – and a mother?